I have great memories of doing this in school, but never realized the amazing things you can make with this technique! You’re basically going to fold one piece of paper in half and cut several slits in the paper where your paper strips will be weaved in and out of. Try doing this with paintings and photos for a really cool effect! 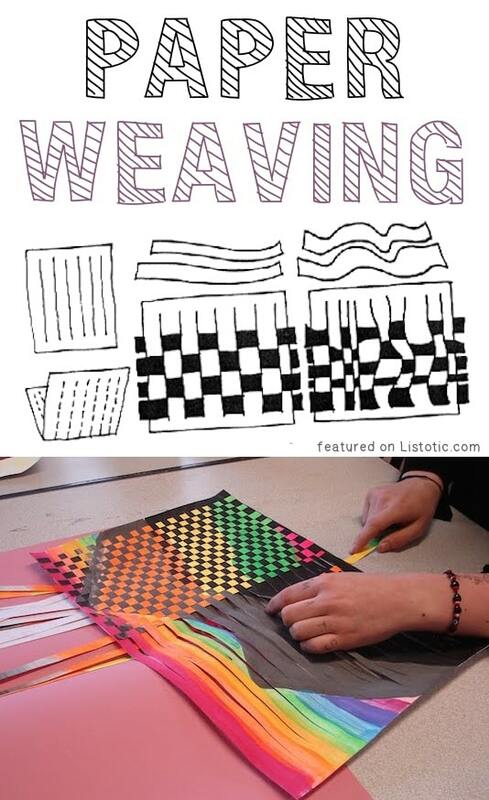 Check out this blog for lots of paper weaving ideas. You would probably never guess that food coloring and glue are a good mix! But, this simple technique will prove otherwise. It makes for really pretty sun catchers the kids will have a blast creating. Aside from the drying time, it’s quick and easy with very few supplies needed. I think it would be fun for kids of all ages! Go get the instructions here. I knew I was going to find a use for that 24 pack of flameless tea lights I bought last summer (not to mention the huge bag of leftover plastic Easter eggs I just found in my garage). Pop one of those little lights into a plastic easter egg, and you’ve got magic! Decorate them with pipe cleaner legs, googly eyes, and duct tape wings to create your very own fireflies. Go get the full instructions here.